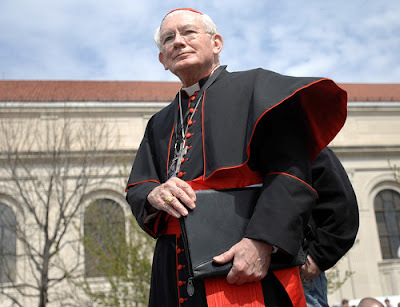 Later this morning, Baltimore's Cardinal William Keeler will undergo brain surgery at Johns Hopkins Medical Center. Aides to the 76 year-old prelate say the procedure will be brief and minimally invasive, involving the insertion of a shunt to drain an accumulation of cranial fluid, or hydrocephalus. The fluid's presence has caused the cardinal some difficulties of thought and movement in recent months, but not too many: on a visit to the Premier See in late April, as I stood with him on the portico of the Basilica of the Assumption, the keen history buff's steel-blue eyes sparkled as he held forth in a lengthy chat on topics as diverse as his 19th century predecessors, the recent NCEA convention in the archdiocese, his Scottish heritage, and even the Glasgow phone book -- which, he assured me, would "turn up a lot of Keelers" if I ever flipped through its pages. Projections from Keeler's medical team are that he should be back in his Charles Street residence on Wednesday. In the run-up to the operation, the eminent patient has earnestly sought out the gift of prayers for a successful surgery and his quick and complete recovery. The cardinal still has much to teach me about Whitfield, Eccleston, and Bayley. As for his own progress, further updates to come.